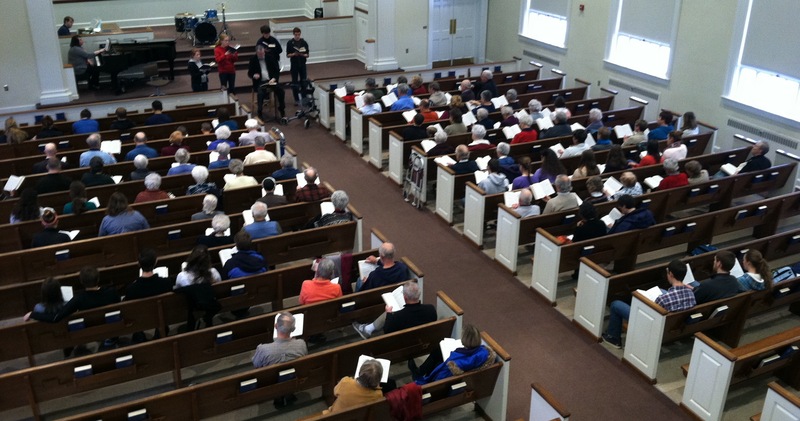 In January 2014, over 100 people turned out for a Brethren in Christ hymn sing, led by Dr. Dwight Thomas. The hymn sing was organized as part of a course I was teaching at Messiah College. 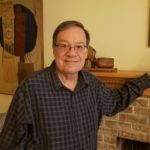 Earlier this year, while teaching a course on Brethren in Christ history and theology at Messiah College, I worked with Dr. Dwight Thomas to organize a hymn sing on the College’s campus. 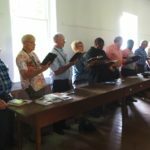 My students were required to attend this event, but the opportunity to sing old Brethren in Christ hymns also drew upward of 100 others: college faculty, staff, and students; pastors and laypeople from local Brethren in Christ congregations; residents of Messiah Village; and others. Now, a bit of context for this question. Those “in the know” will recall that the Brethren in Christ have had five hymnals in their history, published in 1874, 1906, 1935, 1963, and 1984. Most are known by the color of their covers: the green hymnal (1906), the brown hymnal (1935), the red hymnal (1963), and the blue hymnal (1984). 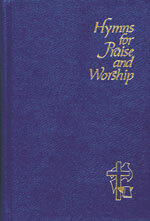 The last Brethren in Christ hymnal is now 30 years old. And in those intervening 30 years, Brethren in Christ music has shifted significantly. Following the pattern of the larger American Evangelical movement, Brethren in Christ congregations have switched from singing primarily traditional hymns to singing contemporary worship songs, the kind produced by the Vineyard or Hillsong movements. They’ve moved from using choirs (which only became mainstream in the Brethren in Christ tradition in the 1950s and 1960s) to using specialized worship teams. And they’ve moved from singing from printed hymnals to singing “off the wall” — from slides projected onto screens positioned strategically throughout the sanctuary. So the question, “Will there ever be another Brethren in Christ hymnal?” is a pretty loaded one — one that suggests the trajectory of Brethren in Christ (and American Evangelical) music over the course of the last twenty-five-or-so years has been bad, and that a new hymnal is needed to stem the tide. Dr. Thomas answered “no” to the question when it was raised at the hymn sing. I tend to agree, although sorrowfully, since I prefer hymns to contemporary worship songs. Given my answer and my antipathy toward that conclusion, I was pleased to read “15 Reasons Why We Should Still Be Using Hymnals,” from the Ponder Anew blog. (As an aside, I love the tagline for this blog: “Discussions about worship for thinking people.” We need more thinking people doing the work of music ministry in the church!) In the post, the blogger divides his reasons for hymnal-use into three categories: Musical, Practical, and Symbolic/Theological. MUSICAL: Hymnals actually teach music. We’re making less music than ever before. Oh, to be sure, there’s lots of music going on around us, but very few people are actually making it. We’re just consuming it, or at the very most, singing along with music someone else made first. But even an untrained musician can look at the words and music in the hymnal and learn to follow melodic direction and rhythmic value. PRACTICAL: Hymnals are as helpful as the singer needs them to be. It’s hard to ignore a screen, no matter how well I know the song being sung. Its mere presence sends most people into a trance. There are times I must pay close attention to the hymnal. I recently sang the hymn “Ye watchers and ye holy ones” in a service. I know of the hymn, and I know LASST UNS ERFREUEN, but I didn’t grow up singing it. I had to follow the entire time. I needed the hymnal. Last Saturday, I sang in the choir for a funeral. It was a beautiful service; a reflection on a life well-lived in service of the kingdom. When it came time for the final hymn, “Blessed Assurance,” I rose, opened the hymnal, and held it out, but didn’t look at it once. I long ago internalized every note and word of this hymn. I was free to look out into the congregation, making eye contact, sharing the ethos of the experience with others. SYMBOLIC/THEOLOGICAL: Hymnals give congregational singing back to the people. Congregations watching screens are at the mercy of whoever is sitting behind the computer. Holding hymnals symbolizes the fact that the voice of the congregation is the primary instrument in corporate worship. It was hard for me to pick just one “Symbolic/Theological” entry to share, since I think hymnals have such profound theological value, both in terms of the content (the songs themselves, which tend to communicate theology in greater complexity than their pop-influenced contemporaries) and the act of using a hymnal itself. Especially for a people like the Brethren in Christ, who value community, mutuality, and “brotherhood,” singing from a hymnal replicates our core values. We share a common page and are united by that page. We join our voices in four-part harmonies that are mapped out for us on the page (as opposed to the screen, which includes no musical notation). Hymnal usage, as the blogger notes in the passage referenced above, “symbolizes the fact that the voice of the congregation is the primary instrument in corporate worship.” We come together as a worship community in using a hymnal: we share the same page, we unite our voices, we can hear one another sing, and we lead one another in that singing. By contrast, contemporary worship bands — in my opinion — tend to transform corporate worship into a performance, where the congregation is simply along for the ride, reading the words “off the wall” and, over the din of the band’s instrumentation, barely able to hear their brothers and sisters joining voices in song. Readers: What do you think? Our church continues to faithfully sing from the “blue” hymnal with an occasional “oldie” from the “brown” or “red” hymnal projected on the wall. Our church also sings songs and choruses projected on the wall. It’s possible to do both, and our church only has about 50 people! I fail to understand why a church of 1,000 isn’t capable of both forms either. In all likelihood, a good number of those 1,000 people would have a deeper connection with God via the unique and participatory practice of singing from the hymnal (especially 4-part acapella, which uniquely joins together all worshipers as a common voice). I’ll jump off the soapbox now, but cast a vote for printing another hymnal! Of course, doing that is even more difficult with the demise of Evangel Publishing House. Fun, Devin. While I appreciate music from all eras of church history (and we use it in our meetings), most of the arguments for a hymnal (above) seem quite “modern” to me. The 1984 hymnal, for instance, is a nice book, but it was obviously the product of people who constricted our choices much more than a computer tech ever did. Good point, Rod — a hymnal selection committee has just as much “control” as transferring our repertoire into digital space, where only a few folks can access it. Your comment raises a lot of good questions that are worth asking when we think about what kind of music we ought to use in our corporate singing. I think the reasoning given by “Ponder Anew” for going back to Hymns are pretty weak. Keep in mind, please, that I’m a classically trained musician (that was my undergraduate degree), so I have love for hymns and other “traditional” music. “Hymnals actually teach music” – Right (sarcasm on). Because the goal of the Church is to teach a wide audience of uneducated non-musicians to properly read and interpret musical notes and notations. It’s not simply to honor God by worshiping him (sarcasm off). This simply bears no relevance at all for the Church’s mission. In addition, most Church centuries did not have music available for Christians to follow – if we want to be historical. I think that whatever people can identify with, and cry out to God with, is what gives singing “back to the people.” If a group can identify with, or is moved to worship God, by a 1732 Hymn, then the people are really singing! If a group can identify with, or is moved to worship God, by a 2014 projected song, then the people are really singing! If a group can identify with, or is moved to worship God, by an African tribal dance and singing with which there are no hymnals or projections, then the people are really singing! In addition, to claim that watching screens puts people at the mercy of the computer tech is a bit ridiculous. People tend to memorize songs – the lyrics are there as reminders and teachers for newer guests. Plus, an error on a computer can be fixed. If someone cannot read music, they are at the mercy of the hymnal. And, I’d suggest, that more people “can’t read music” than there are errors on projections. Jeff: Thanks for commenting! And no offense taken — this kind of dialogue is what I love to see on the blog (and it doesn’t happen nearly often enough). I agree with a lot of what you said: Congregational signing isn’t about teaching people how to sing (because that’s not the mission of the Church), and that worshiping God is central to the corporate singing experience. For this reason, the music (whether hymn or praise chorus) is seen primarily as a conduit for praise, thanksgiving, “crying out,” etc. And I also agree with you that the blogger’s claim that projecting music on the walls puts people at the mercy of the computer tech is a bit ridiculous — though I think purposefully so (hyperbole). His larger point is that hymnals remind us of the richness and volume of songs available to a congregation for corporate worship. Even if we are not singing a particular song on a particular Sunday morning, it’s still there in the repertoire, available for the average congregant to see and to recall (or discover for the first time). Moving the repertoire into the digital space — a place where it can only be accessed by certain individuals — could have an impact as the blogger suggests. I know it sounds Big Brother-y, but in an era in which a lot of churches (including some BIC churches I’ve attended!) tend to sing the same popular worship songs every week, over and over again, there’s something to be said for a very tangible reminder that there’s LOTS of other stuff out there that COULD be sung, too. In the end, I probably personally fall somewhere closer to Jon Stanton’s comment above: that blended worship — worship that incorporates the old and the new, and helps us to hear a variety of voices and provides outlets for a variety of people who are moved to worship by varied forms and genres — is the best way to approach worship and, more specifically, congregational singing. And I think this is what you were kind of getting at when you said that “whatever people can identify with, and cry out to God with, is what gives singing ‘back to the people. '” That populist mentality is great, but I think too few churches really embody it. Because the sentiment behind your comment — that the congregation and its particular contextual needs and situations determine the genres employed during corporate singing — is often used to justify modernization in congregational singing. As I’ve experienced it in the past, the logic is this: “The current generation (which is the one we should be focusing on) ONLY wants to sing the latest, most popular, most contemporary praise-and-worship songs. So THAT’s what we’re going to use in worship.” And as a result we discard hymns, or African tribal music, or whatever isn’t “hip” for a particular target audience. Which I think is a mistake, since we miss out on a lot of good, rich theology and possibilities for spiritual formation when we get rid of hymnals, or African tribal music, or whatever, from our repertoire. And the same would be true if we totally got rid of contemporary worship music, as well. What has become of the “Hymnal Fund”? Donors who contributed toe the 1984 hymnal fund were assured that the proceeds from the sale of the hymnal would be kept in trust with accrued interest to fund the next hymnal. Was this promise to the donors kept with integrity? 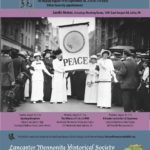 Lester: Thanks for your comment. And good question! Unfortunately, I don’t know the answer. I move that we rename “drumsets” to “hymnals” to fix this problem. 🙂 Just kidding. We have a hymnal??? Just kidding…I don’t think there is a need for another Hymnal in our lifetime, but maybe a 100 years from now, when people will begging for authenticity (or at least a preserved version of authenticity). A 100 years from now I don’t think the church will be saying, we should bring back all of those Chris Thomlin songs!! (Not picking on Thomlin…insert your celebrity worship leader etc.). I think the real question is more about how we worship. WARNING EVERYTHING FROM NOW ON IS MY OPINION! Can we be effective as Church communities, if we don’t live in the same community as our church building? Can we be “The Church” if we cap all “Corporate attendance” to say 100 people? After that you start a new community in an even more closely related group of people. How do we welcome strangers into our church? OR Should we be welcoming them in or should we be “Going out” aka being involved in our communities etc. I would love to have those conversations. How do you have those conversations when it threatens the very existence of the group of people you are having said conversation with! Should we write some Worship Break-up songs??? This is a good discussion. If you have 300 people in a church service, you will have 300 different opinions about worship music. I attend and am a member of an evangelical free church. I grew up in a BIC church where we had great hymn singing, special music and choirs. My church today uses a very contemporary approach to worship (Chris Tomlin, etc.). Sometimes I feel there is no connection between the theme of the sermon and the worship music. We end up singing the same 20 worship songs no matter what is being preached. With that said, I am glad our worship music allows a new generation to worship. However, a good worship leader will integrate hymns (sung traditionally) with contemporary worship songs and special music. Unfortunately, I have not experienced a good balance of music, between old and new. This leads to “worship wars” between older and younger generations and divides the Body. My prediction is that hymns sung traditionally will make a comeback in church services. Because of the old saying that “everything old will be new again”. Here is an idea regarding a hymnal- Many people use their ipads, phones and other devices to read the Bible in church. Why not make a “virtual hymn book” for these devices? Who knows, it could be a hit with the younger generation, especially if each hymn or song would have a sample of it being sung. Instead of the worship leader saying, “Please turn to Hymn No. 279 “Amazing Grace” in the red hymnal”, the worship leader will ask us to download our hymnal app from our device.